Hey all, well I'm on my flight back to Auckland from Wellington, enjoying a wine with cheese platter - how posh is that, AND it's with Air NZ. Impressive. I was down for this years NZSO / TODD Young Composer Readings. It was a great few days with the orchestra and of course seeing all the other young composers at this years event. Below is a picture taken during the readings. Well I came down on Sunday afternoon, ready for the welcome dinner on Sunday evening at Nicolini’s Bistro on Courtenay Place. They have it there every year and if you've been there you'll know why. Absolutely beautiful. YUMMY YUMMY YUMMY. Scattered through the two days are some workshops with players in the orchestra, pretty much getting to know them and their instrument(s) a little better. These are always fun and is great to talk to NZ's finest about their instrument. The second day of recordings again had some very good pieces in. The day ended with some drinks, nibbles and "awards". 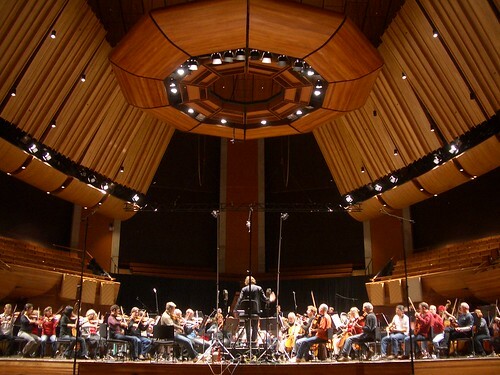 So a successful few days - big thanks to the NZSO for looking after us all very well.